Many studios offer a combination preschool dance class of ballet and tap. We do not. Our Creative Movement Class for preschoolers is ballet based. 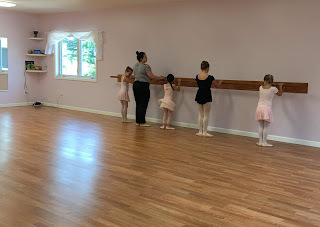 We incorporate fun, developmentally appropriate ways for little ones to learn basic ballet technique and terminology along with basic rhythmic movements. So, why do we not start teaching tap at the preschool age? Well, we have a few reasons. Tap shoes are specialized dance shoes just like pointe shoes are. Dancers need fundamental skills, specific muscle strength, and specific muscle control to use the shoes appropriately. Tap shoes have to fit the dancers feet. Often, to save money, families purchase tap shoes for their child to "grow into." Tap shoes that do not fit appropriately will not allow the child to learn to execute the steps correctly.